A big change in strategy? One of the minor announcements at today's Samsung Unpacked event was that the companyís new flagship smartphones, the Galaxy S6 and the S6 Edge would be bundled with Knox, the company's own business security solutions. The upgraded Knox offers, in Samsung's own words, defence-grade features for real-time protection from potential malicious attacks. Gregory Wade, VP Samsung Knox, claimed that it offered the "best security on market" and would work out of the box by integrating with a much wider range of MDMs (Mobile Device Management) solutions including BlackBerry, Airwatch and MobileIron amongst others. 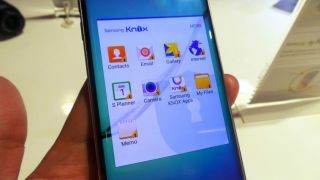 Samsung also quietly bundled Microsoft's Skype, Onenote and OneDrive applications with the new smartphones. All three are free and Microsoft even offered 100GB extra storage for two years with OneDrive. Intel also confirmed that a free copy of McAfee VirusScan Mobile will be preloaded on the S6 and S6 Edge. Unlike its often-preloaded desktop counterpart, this one doesn't seem to be a trial. Other features that Samsung has integrated in the S6 to make it more appealing to a more affluent business audience include an enhanced fingerprint scanner, a reactivation lock and advanced tokenisation.